The Common Tern (Sterna hirundo) colony on Oneida Lake has been monitored since 1976 by Cornell University. The bird is a threatened species in New York State. Due to the millinery trade and habitat loss, the Common Tern experienced a severe population decrease in the early 20th century. The Common Tern is a migratory bird and a nesting colony utilizes Oneida Lake as its summer breeding grounds from early May to early September. 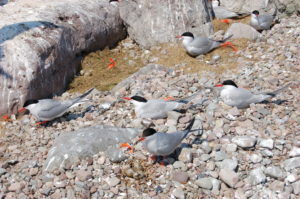 Cornell University’s work on Oneida Lake has been, and is currently focused on, increasing Common Tern numbers and aiding the birds in establishing a stable, self-perpetuating, inland colony. Restoring the Common Tern to its native habitat enhances biological diversity and allows for the persistence of a species with its own intrinsic value. 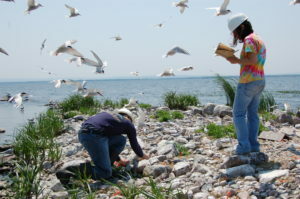 Traditionally, Cornell has monitored the Common Tern population and provided the birds with several forms of habitat enhancement, including nesting material and chick shelters. We also install a gull exclusion grid to reserve nesting space on Little Island and reduce competition with Ring-billed and Herring Gulls. We plan to continue our monitoring practices and efforts to increase tern numbers.